Launched with characteristic Apple flash, Apple Pay has become the most marketed digital wallet in the U.S. -- or so it seems. Apple, banks and credit card companies have all mounted major advertising campaigns to promote the new service. According to Gallup's analysis, the push worked -- at least to create awareness of this new product: Nearly two-thirds (65%) of consumers are at least somewhat familiar with Apple Pay. Awareness among current digital wallet users jumps to 78% and is highest (89%) among current Apple Passbook users. But awareness doesn't always lead to usage. Gallup finds that only 21% of iPhone customers actually use the Passbook app, and iPhone represents just half (48%) of the smartphone market. Though Apple is better positioned to drive adoption than some of its digital wallet competitors, it still has a way to go before Apple Pay becomes ubiquitous. 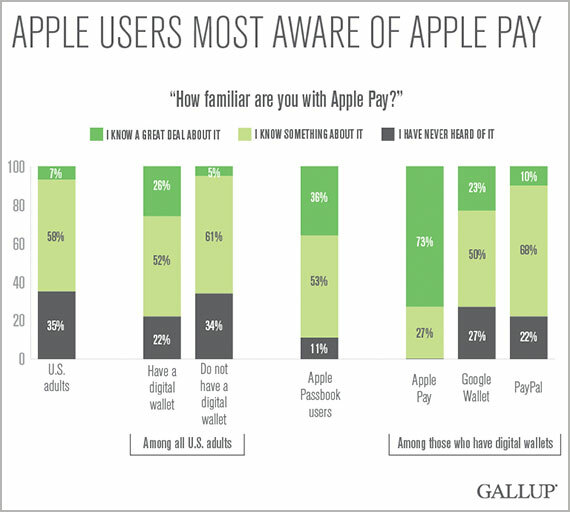 Only 6% of consumers surveyed by Gallup say they are very likely or likely to start using Apple Pay in the next 12 months. 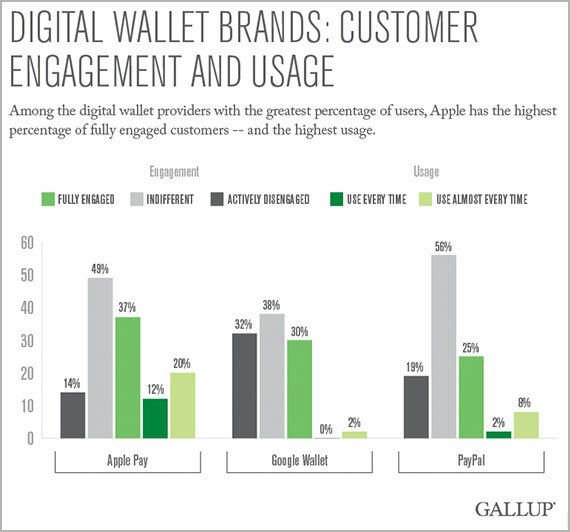 This reality isn't unique to Apple, as Gallup's analysis shows that most customers are still looking for value in a digital wallet provider. Apple may hope that its digital wallet can entice potential customers to purchase or switch to an iPhone, but the feature doesn't appear to be compelling enough. Seventy-seven percent of consumers say the availability of Apple Pay has no influence on whether or not they will buy an iPhone. In fact, a greater percentage of consumers say the availability of Apple Pay makes them less likely to buy an iPhone, compared with those who say it makes them more likely. Apple Pay may be an added benefit for current Apple users, but it appears unlikely to be a feature that will entice loyal Android users to switch. Though Apple Pay may not be attracting new customers to the iPhone, Apple can take solace in the fact that its digital wallet far outpaces its competitors in customer engagement and usage. Among the digital wallet providers with the greatest percentage of users -- Apple, Google and PayPal -- Apple has the highest percentage of fully engaged customers at 37% and by far the lowest percentage of actively disengaged customers at 14%. Google Wallet has been out much longer, and though it has more fully engaged customers than PayPal -- 30% versus 25% -- it also has more actively disengaged customers (32%) than Apple Pay (14%) or PayPal (19%). Apple also has the highest usage among the three most-used digital wallet providers, with 32% of customers saying they use the technology every time or almost every time it is available. This percentage is more than three times higher than the 10% who say they use PayPal every time or almost every time and 16 times higher than the 2% who say they have the same usage pattern for their Google Wallet. As time goes by and more people use Apple Pay, it will be interesting to see if the percentage of actively disengaged customers rises and usage decreases -- or if Apple will continue to top its competitors in customer engagement and in usage patterns. Results are based on a Gallup Panel Web study completed by 11,043 national adults, aged 18 and older, conducted Nov. 20-Dec. 1, 2014. The Gallup Panel is a probability-based longitudinal panel of U.S. adults who Gallup selects using random-digit-dial phone interviews that cover landline and cellphones. Gallup also uses address-based sampling methods to recruit Panel members. The Gallup Panel is not an opt-in panel, and panel members do not receive incentives for participating. For results based on this sample, one can say that the maximum margin of sampling error is ±1 percentage point, at the 95% confidence level. Margins of error are higher for subsamples. In addition to sampling error, question wording and practical difficulties in conducting surveys can introduce error or bias into the findings of public opinion polls.